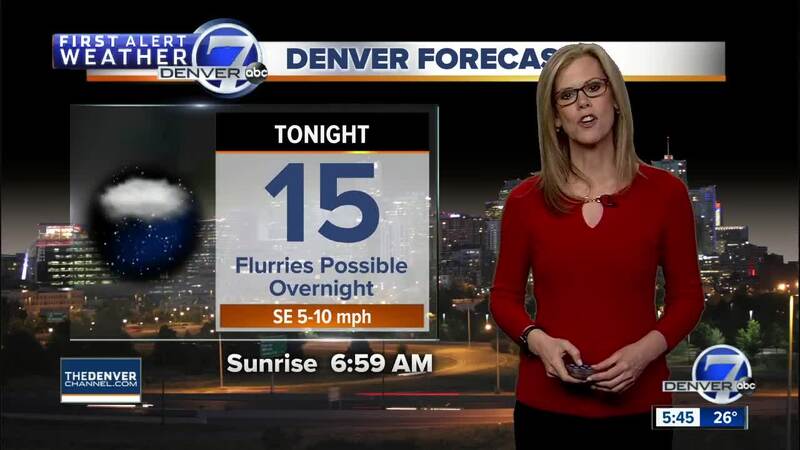 Meteorologist Stacey Donaldson has your latest Colorado forecast. DENVER — A weak system brought cold air into Denver and the plains for Saturday afternoon. Highs reached nearly 50 degrees, but 2 hours later our temperatures dropped by 25 degrees. Because of this system we have a chance for flurries overnight. It should also clear out by morning. Skies will be clear for Sunday, but not for long as another in a series of weather disturbances will begin to move into the state from the West Coast. Monday will bring a few inches of snow to the mountains, but just some clouds for the plains. More of the same can be expected for Tuesday and Wednesday - some mountain snow, but just periods of wind and clouds for the eastern plains. Thursday may be a little different, with heavier snow in the high country and light snow for Denver.